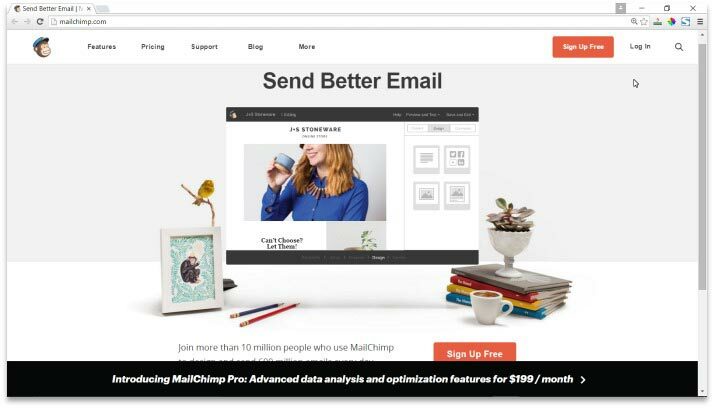 MailChimp is a brand leader in email marketing services. Since 2001, the company has steadily increased its customer base. Thanks to their easy to use and simple email marketing software, they have more than 10 million satisfied customers. Email marketing software from MailChimp offers the best in email newsletter designing. Their out-of the box, signature templates is a major plus point. It allows easy integration with different platforms and enables personalized publishing on social networks. This software is very popular with small businesses with less than 2000 contacts on their mailing list as the free plan suits them best. It not just provides the best designing tools, but also analytics to keep track of the newsletters reach and how best to improve the response. The mantra for a successful marketing campaign is to target customers with personalized messages, and the best way to do it is through emails. MailChimp offers a comprehensive plan to start successful campaigns irrespective of the nature of the business or geolocation. Although such email campaigns can do wonders for a business, it is best to use it appropriately. In-built reporting features with tips to avoid mail campaigns getting categorized as spam ensures best performance of mail automation. The free forever plan from MailChimp allows their clients to reach out to a small group before expanding to a bigger base. The easy to use features to track and manage mailing contacts and replicate campaigns are very helpful when compared to other such programs. Their templates are rather unique and trendy, designed to catch the attention of customers. Templates are mobile apps friendly and look the same on various screens. Mail Chimp offers great customer support by way of online chats and informative video tutorials for beginners. MailChimp email marketing software is simple and user-friendly (apparently even a chimp can use it). They currently have more than 10 million satisfied customers. MailChimp has made a niche for itself in the email marketing software segment by offering unique newsletter templates. Their free plans are best suited for small businesses without having to worry much about the performance of various campaigns. Their web tutorials and customer support is another major plus and the reason for their many satisfied customers. Plans are highly priced but their comprehensive analytical data helps customers get the best out of their campaigns. Have you had an experience with this company? Please share your MailChimp reviews below. I went to mailchimp after leaving one of their competitors and am i guess overall satisfied. It took a while to understand their flow (templates, automation etc.) but like it now that I understand how it works.